Last week I took a trip to the Mainland. Terrifying, I know. People really do spit all the time. Still, incredible. 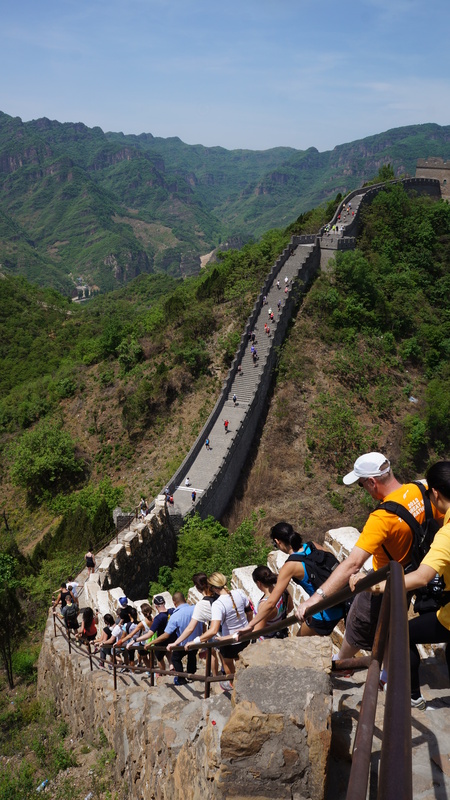 Since I was a child, (I think I decided after I sprained an ankle and couldn’t walk for a while) I have wanted to run on the Great Wall. I decided this, and wrote it in a little notebook of life goals, mostly because I wanted to be the type of 10 year old who had major life goals. When I moved to Hong Kong last year, it seemed a little bit closer. There would be no excuse. We signed up in the winter, paid the insane sum, and later bought our flights. Then the trip sort of snuck up on us. We didn’t get our (expensive) China visas until 2 weeks before, but it was fine, fear not. We hopped on a plane at 8AM in Hong Kong and arrived in Beijing to somewhat clean air. Beijing is a fantastic city in many ways. Food is delicious, so long as you are slightly off the most touristic paths; the subway is effective, so long as you are within a 10 minute walk; the old alleyways or hutongs are charming and feel like you could call them ‘real China’. There is always something to discover, and always some historic site to geek out about. On our first day we went to Tiananmen square and freaked out slightly with our cameras. I have a couple of friends/acquaintances in Beijing now, so we got some special tours of their neighborhoods: replete with the expat bars, breweries, and local(ish) Peking duck. The area around Nanluoguxiang Hutong is fantastic, if slightly touristic. And you should not miss the Temple of Heaven which is mostly used as a park for tai chi, badminton, cards, and singing with the accompaniment of a two stringed instrument (erhu). Of course I haven’t even gotten to the wall yet. We spent two days on the wall and one day in a town called Jianxin. In Jianxin, we opted out of the official tour to some tombs and wandered around the small town of a few million instead. Which was completely amazing. 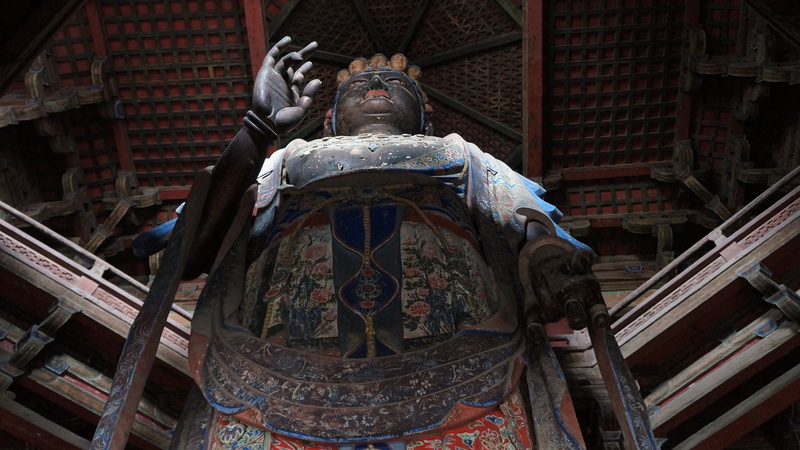 We spent the morning exploring Dule Temple, which as it so happens is the oldest multi-story timber structure in China, and contains a 3 story tall clay statue of an 11 headed Buddha. I studied comparative religion, so I was excited. We even threw coins at a bell for good luck. While there, we wandered into a side corridor and found men making ink prints of the wall carvings: pounding ink into canvases stuck onto the tablets. They were also for sale. Since we have a weakness for art, and like seeing how things are made, we bought a print of the calligraphy. We may or may not have room to hang it up in our apartment. Also in the temple, we ran into some other runners and proceeded to go around the city with them and have a noodle lunch. Miraculously, my Chinese lessons from 5 months ago were actually helpful. Noone in the restaurant spoke English, and the waitress looked so relieved when I could say, “I want two of these!” I was excited, again. Onward to the run! On Saturday morning, we woke up at 4, checked out, ate breakfast at 4:30 and were at the Wall by 6. The Huanyaguan section is about 4k uninterrupted. It was a bit smoggy, and foggy; I really couldn’t tell which. If you have ever done something that you have wanted to do for your entire memory, then you may know how I was feeling. It was absolutely exhilarating. No one had a real goal time in mind, no one was racing it (except the record breakers). Everyone was just there to have a fantastic time running on the wall. Of course, first we had to do a 5k uphill run. 2,500 runners crossed the line in 5 waves, and on the wall itself there was a nearly single file stream of thin athletes, jogging the flats and downs, and then marching up hundreds of steps. We looked out over what was once barbarian Mongolia, and the extent of the kingdoms of China. We descended from the wall, and did the second half of the half marathon on the roads and through a small village, and an orchard. On the way back to the finish line, there were some cars on the road next to the orchards, spewing fumes, and there were some moments when it was hard to breathe, but that may have just been because I had already run 12 miles. I finished only 30 minutes slower than my last half marathon. Then ate a lunch and banana, drank a can of Nanjing, showered in the old village, received my free massage (which I am sure I paid for), and bussed back to Beijing to eat dinner with a friend. 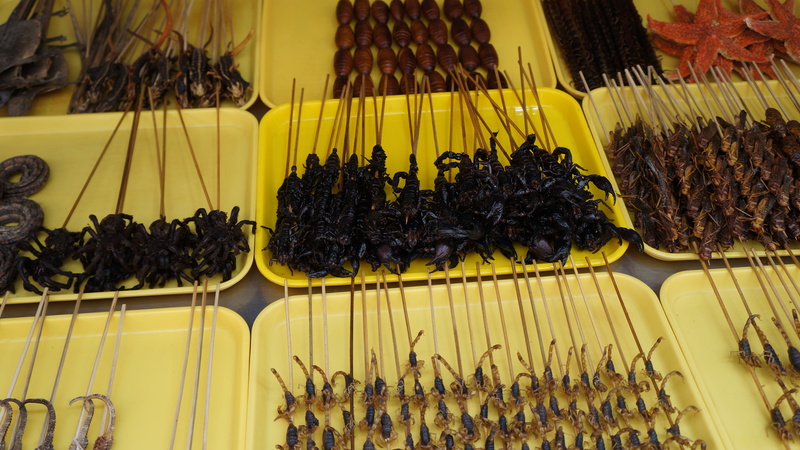 Of course on our last day we went up to Wan Fu Jing area and ate scorpions and seahorse, bought some souvenirs, and had a 2 hour tea break. All in all, my China experience was everything I wanted it to be. Aside from the dust storm on Sunday, and terrible taxis who find it impossible to turn left, the trip was stunning. Though it was a relief to be back in Hong Kong with the Cantonese and MTR and my own bed. If you want to do it, go to http://www.adventure-marathon.com/ , you have to sign up through a travel agency in your country home base, hence the expense. It is an incredible experience. The camaraderie of running, and the knowledge that I accomplished something really cool made the whole trip that much more incredible. I even have a few new friends.